Be happy, dear hearts, and allow yourselves a few more weeks of quiet exultation. It isn’t gloating, it’s satisfaction at a job well done. He was a superb candidate, serious, professorial but with a flashing grin and a buoyancy that comes from working out in the gym every morning. He spoke in a genuine voice, not senatorial at all. He relished campaigning. He accepted adulation gracefully. He brandished his sword against his opponents without mocking or belittling them. He was elegant, unaffected, utterly American, and now (Wow) suddenly America is cool. Chicago is cool. Chicago !!! We threw the dice and we won the jackpot and elected a black guy with a Harvard degree, the middle name Hussein and a sense of humor he said, “I’ve got relatives who look like Bernie Mac, and I’ve got relatives who look like Margaret Thatcher.” The French junior minister for human rights said, “On this morning, we all want to be American so we can take a bite of this dream unfolding before our eyes.” When was the last time you heard someone from France say they wanted to be American and take a bite of something of ours? Ponder that for a moment. The world expects us to elect pompous yahoos, and instead we have us a 47-year-old prince from the prairie who cheerfully ran the race, and when his opponents threw sand at him, he just smiled back. He’ll be the first president in history to look really good making a jump shot. He loves his classy wife and his sweet little daughters. At the same time, he knows pop music, American lit and constitutional law. I just can’t imagine anybody cooler. It feels good to be cool, and all of us can share in that, even sour old right-wingers and embittered blottoheads. Next time you fly to Heathrow and hand your passport to the man with the badge, he’s going to see ” United States of America” and look up and grin. Even if you worship in the church of Fox , everyone you meet overseas is going to ask you about Obama, and you may as well say you voted for him because, my friends, he is your line of credit over there. No need anymore to try to look Canadian. The day after the election I wore my Obama button to shop. To any African Americans I saw I said, “YES WE DID” proudly. My husband and I donated $2500 last January to the campaign so I did take a little credit for us. When I saw the TV show “President Elect Obama”at 11 P.M. on Nov.4th and saw all the black and white folks in the park in Chicago bawling, I cried too. I should say that I am a 77 year old white woman, born in Birmingham, Alabama, grew up in Atlanta, Ga. and live in infamous Cobb County, Ga., a red state and absolutely adore our new president. I knew he would be president some day at the Demo. Convention in 2004 but never dreamed it would be this soon. Thank God it was!!!! Jody – my eyes moistened up just reading your comment. Thanks for doing what you and your husband did. We are all proud. 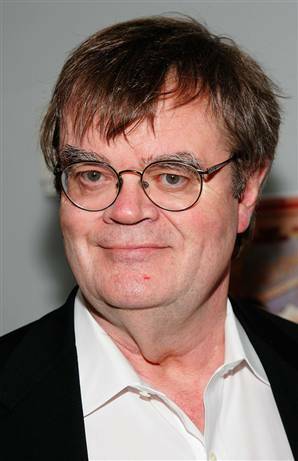 I never noticed it before, but Garrison Keillor looks like an older version of that actor in The Office. What’s his name? you know who I mean. Very nice remarks. I agree totally. Yes, indeed. I can now retire the Maple Leaf backpack. I like the cut of this guys jib.. just looked him up after hearing him on BBC radio 7.. smashing stuff!